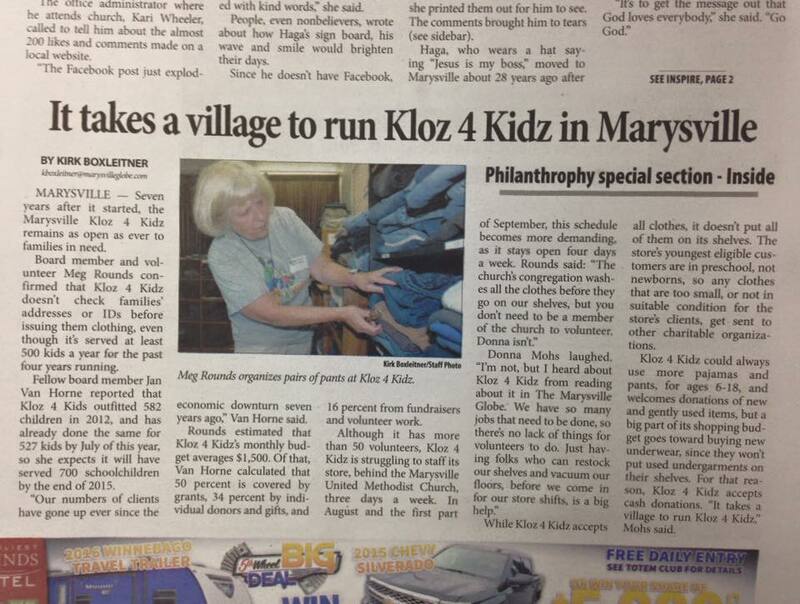 Kloz 4 Kidz is a ministry of the Marysville United Methodist Church to help school aged children in the greater Snohomish area have decent clothes to wear to school. They are provided with new and gently worn clothing that has been donated through clothing drives and monetary donations. Each child always receives a new pair of shoes and new underwear and socks. Volunteers at Kloz 4 Kidz are specially trained to serve the children of our community in a friendly and positive manner. We are open to help with children’s clothing needs on Tuesday and Thursday afternoons and Saturday mornings. Families may come in once every four months by appointment only. If you need clothing or want to help by volunteering, please call 360-658-1021. Make a secure financial gift to Kloz 4 Kidz. Visit Kloz 4 Kids website.